Vasectomy and hysterectomy seem to work better in controlling feral cat populations than neutering, according to a new Tufts study. The findings, derived from a computer simulation of a feral cat colony, support trap-vasectomy-hysterectomy-release (TVHR) as more effective than the widely used trap-neuter-release (TNR). While TNR works in small colonies and controlled environments, there is little evidence to support its effectiveness over large areas, says Robert J. McCarthy, lead author of the study, published in the August 15 issue of the Journal of the American Veterinary Medical Association. “The next step is to gather evidence about how it actually works in the field,” says McCarthy, an associate clinical professor of small animal surgery at the Cummings School. 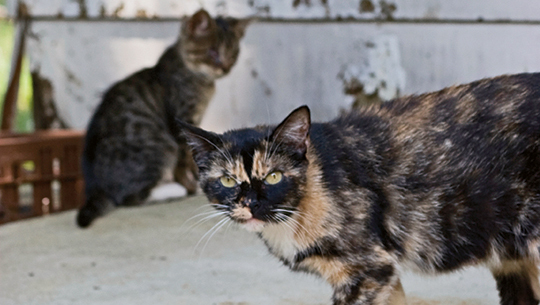 Even small populations of feral cats can have a negative impact on wildlife and public health. While the exact number of wildlife killed each year is up for debate, feral cats represent a significant cause of death in birds, small mammals, reptiles and fish—and even have been responsible for the extinction of some species. Outdoor cats also can contribute to human health problems because they can carry such diseases as rabies, toxoplasmosis, cat-scratch disease and plague. Trap-neuter-release has gained popularity as an alternative to euthanasia to control feral cats, accounting for births and deaths. Stephen H. Levine, a professor of civil and environmental engineering at Tufts School of Engineering, developed the computer model to assess the effectiveness of vasectomy (vs. castration) and hysterectomy (vs. ovariohysterectomy). Each computer run simulated a feral feline population over 6,000 days—longer than the typical lifespan of a feral cat—and tracked the daily movements of individual cats accounting for births and deaths. Dominant males that are castrated in a TNR program become sexually inactive and are succeeded in the breeding hierarchy by the next most dominant male. When a feral male undergoes a vasectomy (the testicles are retained), his “life span, sexual drive and social status aren’t altered, so he’ll fend off competing males who try to intrude into his area, even though he can’t actually produce offspring,” says J. Michael Reed, a study co-author and professor of biology at Tufts. In addition, when an intact female mates with a vasectomized male, Reed says she enters into a 45-day “false pregnancy,” which further reduces the chances for more offspring in the colony. The researchers note that the popularity of TNR in the United States has been a result of the veterinary and humane society communities wanting to improve these animals’ quality of life though vaccinations and other basic care, reduce nuisance behaviors and eliminate colonies over time. The main disadvantage of trap-vasectomy-hysterectomy-release is that because the animals are hormonally intact, they still may demonstrate related problem behaviors, such as spraying by male cats.